Chenjia Town, China—The Links Course at Lan Hai International Golf Club, a Jack Nicklaus Legacy Golf Course that opened for play in 2011, will be the backdrop beginning today for the Lanhai Open on the PGA Tour China Series. Jack Nicklaus II, namesake and oldest son to iconic champion and global designer, was the lead designer on Lan Hai’s Legacy Course, and he rightfully feels proud when he speaks of the facility’s two designs he collaborated on with his father. The PGA Tour China Series’ Lanhai Open is underway on the Links Course, a layout adjacent to the Yangtze River on Chongming Island in the Shanghai metropolitan area. 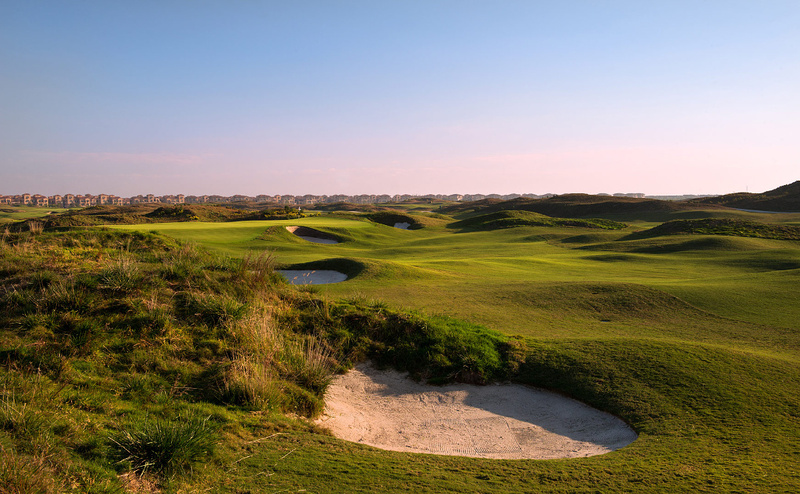 The 7,346-yard course is the longest of the four sites to host a Series’ event this season, and in 2013, the course was named to Golf Digest China’s biennial list of the Top-10 New Golf Courses in China. The course, a par 72, is hosting its first major Tour event of any type. The younger Nicklaus calls the Links Course “probably the most I’ve stepped out on the edge of any golf course I’ve ever done.” He’s quick to add that while the Links will challenge PGA Tour China Series players, it will be fair to those in the field for the fourth tournament on the schedule. That was the case during the Monday qualifier, won by South Korea’s Hyun Hong Ju with an even-par 72. With constant, high winds anticipated, often in the face of players, officials decided to move tees up to make the course more playable. PGA Tour China Series order of merit leader Sam Chien has used a strategy of sacrificing distance off the tee versus keeping his ball in play during his strong play in the Series’ first three events. Not relying on his driver may not be an option this week for Chien, who won earlier in the season at the Buick Open in Guangzhou. Chien admitted he is rethinking his game plan for the Lanhai Open. Following the Lanhai Open, players will travel north to China’s capital for the Beijing Open (June 12–15), the first time the Series hosts back-to-back events this year. The Series will then observe a two-month break before resuming play in mid-August—for the seven-event finish to the season.